Can Ante-post Bets Provide You with a Valuable Source of Income? The term “ante-post” is used to describe placing a bet at least a day in advance of the event. These wagers are especially popular in horse racing and it is normal for bookmakers to offer odds on a major event such as the Grand National almost a year in advance! For example, you can get 20/1 on Tiger Roll retaining his title in 2019. The purpose of ante-post betting is to get excellent value with the odds and savvy punters can take full advantage if they know what to look for. One example would be backing a horse to win the Cheltenham Gold Cup before the King George VI if you believe he has a shot of winning that particular race. If he is 40/1 for the Gold Cup before the King George VI and wins that race, the horse’s odds will certainly tumble. With better odds comes a greater level of risk. In horse racing, trainers pull horses out of races all the time for a variety of reasons. Lack of fitness, injury, or unsuitable ground are just some of the issues that result in non-runners. As such, you should only place an ante-post bet with a bookmaker that offers money back in the event your selection doesn’t enter the race. The Queen Anne Stakes at Ascot takes place on June 19 this year. As of June 4, Rhododendron is the 3/1 favourite. If you go back to May 6, she was 14/1 on Bet365! 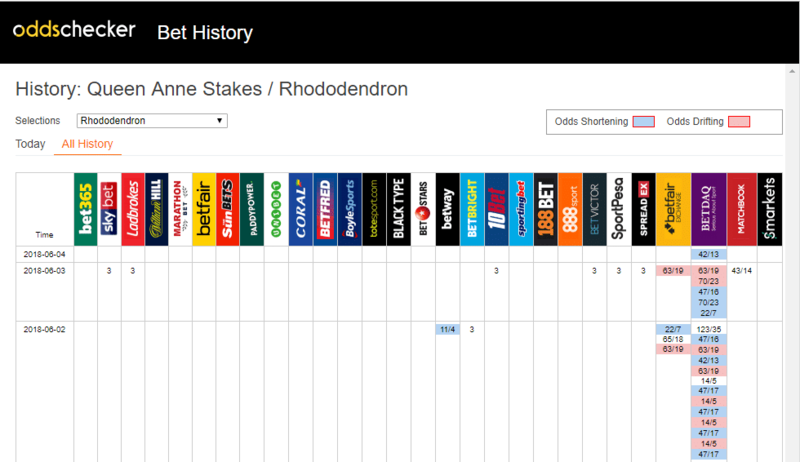 Interest trickled in and Rhododendron’s odds came in to around 8/1 – 10/1 before Lockinge Stakes at Newbury on May 19. She defeated Lightning Spear by a short head and suddenly, her odds were slashed across the board. On June 4, Cracksman was 5/4 to win the Prince of Wales Stakes which take place on June 20; although 888Sport has him at 5/6! He barely scraped by when red-hot favourite at Epsom recently but jockey Frankie Dettori later revealed that the horse bumped his head in the stalls which accounts for his erratic performance. As you can see, Cracksman was available at 4/1 on April 10 so if you backed him then, you’re sitting pretty. To be clear, finding good ante-post bets is a difficult skill and takes practice. Don’t use the Betfair Exchange because if your horse is a non-runner, you lose your entire stake. In ante-post betting, you’re normally dealing with major races and it is hard to try and find winners without knowing the horse’s form, jockey, draw, going, the field, and a host of other factors. Rather than looking to back ante-post bets to win the races, look for “back to lay” opportunities. For instance, if you backed Rhododendron to win the Queen Anne Stakes at 14/1, you can take a chance at the Exchange and ‘lay’ her. Since she is the favourite and her odds are unlikely to drift much, it may be a good idea to wait until she is a confirmed runner before placing the lay bet. An ante-post bet is effectively a “double” wager. First, you’re betting on the horse lining up in the race, and then you’re backing it to win. When looking at horses from established yards such as Aidan O’Brien’s, remember that only a few of his entries will contest any given race regardless of its prestige. For example, there are 50 possible runners for the Darley July Cup Stakes on July 14 at Newmarket. At the time of writing, O’Brien has 14 possible entries! In this case, always look for the stars of the stable in major races because they are obviously the likely runners. For the record, it is worth checking out ante-post prices offered directly after an event. Bookmakers are not always uniform in this aspect of collating their odds because they often have very different viewpoints on potential outcomes. As a result, there could be a significant difference between the odds available for a few hours at least. 6yos have an excellent recent record. Horses that have finished in the top two in their most recent run are prime contenders. If we focus solely on the above, we can create a shortlist of contenders. It is also a good idea to check out where the money is going on Oddschecker. For instance, I can tell you that while the favourite, Battash, has the most money on it, 12/1 shot Kachy is next in line with almost 20% of bets being placed on the Bay Horse. Kachy’s recent form is good having lost by a head to Battash at Haydock, albeit with five pounds less. The 12/1 odds on Kachy are only available at a handful of bookmakers as several of them have him as low as 8/1. He was 33/1 as late as May 11! With money pouring in right now, it is possible that Kachy could be as low as 5/1 or even less by race time. First and foremost, only place an ante-post bet with a bookmaker that offers money back for non-runners. Once you remove this risk, you have a unique opportunity to find great value bets for major events. Imagine your glee when you pick a 50/1 shot that is 3/1 or less by race time! You could run the risk of getting nothing or place a lay bet for a healthy guaranteed profit. Be sure to check racing news to see if a horse is likely to run in the event. You should get a fair idea of whether a horse will run or not by perusing sites such as the Racing Post or Sporting Life. Analyse the field to determine if there are overpriced horses just waiting to be backed. When you get ante-post betting right, it is a source of high-probability income; but it takes a lot of skill!